Solid Core 1/0.6mm wire, ideal for internal panel wiring, this wire will stay in the required shape, without the use of ties or straps. It is also ideal for use with prototyping breadboards. Available in ten colours on 100m reels. Mixed pack of solid core wire, ideal for internal panel wiring, this wire will stay in the required shape, without the use of ties or straps. Contains 5 metres of the following colours:-White, Blue, Brown, Green, Yellow, Orange, Grey and Purple and 10 metres of Red and Black. Stranded wire 7/0.2mm ideal for internal wiring and all general low current applications. Available in ten colours on 100m reels. Mixed pack of stranded wire, ideal for internal panel wiring. Each pack contains 5 metres of the following colours:-White, Blue, Brown, Green, Yellow, Orange, Grey and Purple and 10 metres of Red and Black. Stranded wire 16/0.2mm plain tinned copper conductor. 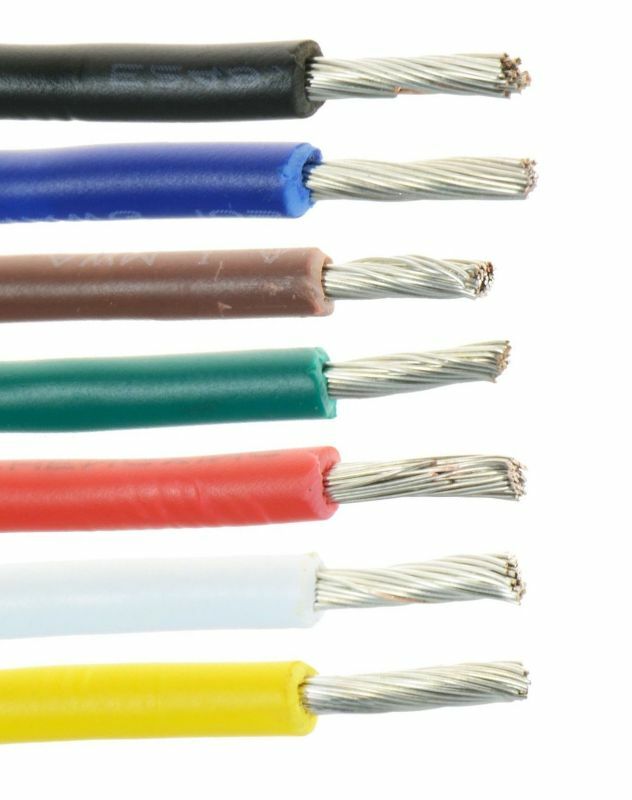 A PVC insulated wire intended for the internal wiring of electrical and electronic equipment. Manufactured to DEF.STAN. 61-12 part 6 & BS4808. Available in ten colours on 100m reels. Stranded wire 24/0.2mm plain tinned copper conductor. A PVC insulated wire intended for the internal wiring of electrical and electronic equipment. Manufactured to DEF.STAN. 61-12 part 6 & BS4808. Available in ten colours on 100m reels. Extra flexible 55-Strand plain copper conductor. A very flexible wire ideal for test leads and as interconnection wires which are frequently being moved. Available in six colours on 25m reels.